I was looking up math in the news today, and ran across a new blog/column on the Washington Post: X=Why? Michael Alison Chandler is going back to high school at the age of 32 to take an Algebra II class and give her perspective. She’s only posted one entry so far, but I’m curious about what her experiences will be, and if she’ll come away feeling any differently about mathematics. At the end of that article she invites people to submit their best and worst word problems so I was searching around, and I came across a wedding message board in which a couple had decided to put word problems on everyone’s seating cards at the reception. Guests would then have to solve the problems to figure out where to sit. R and A have planned to depart Vancouver at 4:00 PM on Friday, September 12 to complete their honeymoon. Vancouver’s sunrise is 3 hours later than Boston’s. Their jet, which is carrying 132 passengers, travels at an average airspeed of 568 mph with an average tailwind of 32 mph. If Rob and Ashima’s plane arrives in Boston at 6:40 AM, how many thousands of miles apart are Calgary and Boston? I totally wish I’d been invited to this wedding. Rosh Hashana begins today at sundown. It’s often referred to as the Jewish New Year, since it marks the start of the year 5769, but unlike the January celebration for the year 2008 it’s celebrated over two days. This is because Rosh Hashana always starts on the first day of the lunar month of Tishri, and traditionally months were officially declared by the Sanhedrin when a new moon was sighted. Messengers were sent out to share the date of the new month, but the most distant communities didn’t get the news in time and so to be safe they celebrated the start both 29 and 30 days after the previous month’s start. This custom continued even after the exact start of the month could be predicted mathematically. As a math activity for these two days, you can make a Star of David out of interlocking Möbius strips (where “interlocking” is actually more like weaving). The half-twist in the Möbius strips means that the pieces will lie flat. TwoPi observed (when looking over a draft of this post) that since in general it is possible to form interlocking links by cutting a twisted loop in half lengthwise, it might be possible to create this design by starting with a single loop and then cutting it. I tried, but wasn’t able to come up with anything: a loop has to have an odd number of half-twists to lie flat (like the Möbius strip itself), but if it has an odd number of half-twists then it will be a single twice-as-long loop when cut. On the other hand, loops with an even number of half-twists form two interlocking loops when cut lengthwise, but the resulting loops will also have an even number of half-twists and so look a little bulgy. The closest I came was starting with a loop with two half-twists, but the resulting design just didn’t look as nice as the picture above. That’s Elvis the dog, not Elvis the person. Elvis belongs to Tim Pennings from Hope College and likes to play fetch on the beach. When he went to catch a tennis ball, he’d run along the beach for a while and then swim. So his owner checked, and it turned out that he was using the nearly optimal path for reaching the tennis ball. The video above is from CNN and a friend just sent it to me (thanks Ginny!). In doing a search I discovered that although I hadn’t heard it before, it’s been around for a while: Ivars Peterson wrote about it in Math Trek five years ago. Still, a story that features both calculus AND an Elvis? I couldn’t resist. The long-awaited 40th Carnival of Mathematics has arrived, courtesy of Barry Leiba over at the blog Staring at Empty Pages. When I was looking over the blog earlier this week I thought, “Hey, I’m going to link to his series on Paradoxes, because I like the explanation and examples of the different kinds of paradoxes, but then it turned out that the series appeared in Carnival #40 anyway. And so did a description of Euclid’s Elements that has a directed graph showing what is needed to prove what (which I’ll certainly be showing to my Geometry students in the spring!) and plenty of other neat posts. So go check it out! Season 5 of Grey’s Anatomy starts tonight, and the big question out there is, “Will there be any math on the show this year?” Because there was in Season 3. Remember how Izzie Stevens got a check for $8,700,000? Seven Episodes later, in Episode 11 (“Six Days — Part I”), Izzie still has the check on the front of her fridge, and the psychiatrist won’t clear her for surgery until she deposits it. But Izzie has gotten to know a patient who is going to have her spine straightened and she really wants to scrub in, so she confronts Miranda Bailey and tries to convince her. The scene ends with this : Dr. Bailey: Did you deposit the check? Izzie: It’s my money. I should get to do what I want with it. Dr. Bailey: You get a 5% return on a 6-month CD? Izzie: (says nothing) Dr. Bailey: In the time we’ve been standing here you could’ve just made 400 dollars. When Bailey made that last remark, they’d been standing there for 29 seconds. So what is the actual value of the interest Izzie would have earned during that conversation? CDs generally seem to have interest compounded monthly, although if Izzie had only recently deposited the check the interest wouldn’t have had time to compound yet so we can ignore that. During the first month, assuming 5% annual interest, Izzie would earn $8,700,000(0.05/12)≈$36,250 in interest. If there were 30 days in the month, that amounts to $1208.33 per day (not “thousands of dollars a day in interest” as mentioned earlier in the episode — the interest rate would need to be about 8.3% for that kind of yield). There are 86,400 seconds in a day, so that $1208.33/day translates to just about 1.4¢/minutesecond, which only amounts to 40.6¢ in 29 seconds. Dang, Bailey was way off. I guess, “In the time we’ve been standing here you could’ve just made 41 cents” doesn’t quite pack the same punch. Another math post from the Fail Blog! How Is Math Like Ballroom Dancing? At this point in the videotape he always wonders if he’s inadvertently set his beer down on the fast-forward button, or something, because the dancers go straight from their vicious Randy parody into something that obviously qualifies as advanced dancing. Randy knows that the steps they are doing are nominally the same as the basic steps demonstrated earlier, but he’s damned if he can tell which is which, once they go into their creative mode. There is no recognizable transition, and that is what pisses Randy off, and has always pissed him off, about dancing lessons. Any moron can learn to trudge through the basic steps. That takes all of half an hour. But when that half-hour is over, dancing instructors always expect you to take flight and go through one of those miraculous time-lapse transitions that happen only in Broadway musicals and begin dancing brilliantly. Randy supposes that people who are lousy at math feel the same way: the instructor writes a few simples equations on the board, and ten minutes later he’s deriving the speed of light in a vacuum. You can read more about the cereal eating here, but you should really just go read the whole book. As the list of numbers goes on, the ratio of successive terms gets closer and closer to the Golden Ratio ø≈1.618. And another number that’s close to 1.618 is the number of kilometers in a mile (1.609). This means that Fn miles is approximately Fn+1 kilometers, where Fn and Fn+1 are successive Fibonacci numbers. In other words, if you’re driving at 13 miles per hour, that’s approximately 21 kilometers per hour (actual: 20.9). If you’re driving at 21 miles per hour, that’s approximately 34 kilometers per hour (actual: 33.8). This way cool observation was found at Futility Closet, found via the Evil Mad Scientist Laboratories August Linkdump. Carnival #41 will be hosted by….us! We’ll be posting in two three weeks (Friday, October 3 10). You can submit via Comments here, through the official BlogCarnival link, or by sending an email. (The last part is @naz.edu and before the @ you can type either “mkoetz1” or “hlewis5”. Put something like “Carnival” in the title so that nothing gets lost.) Please spread the word! How Good Are You at Estimating? You can take the same “dots test” that the research subjects took here. The test claims that an “average adult” will score around 75% over a reasonable sample of tests (at least 25). (Does that mean the “average adult” would probably get a ‘C’ in calculus?) How does your score correlate with your math grades? Ahoy Matey! September 19 is International Talk Like a Pirate Day! Time to break out the parrots and rum and enjoy a pirate comic or two. In keeping with the pirate theme, I sprinkled doubloons, gold coins, and pieces of eight on a test I just gave (the words, not the actual coins). And that got me thinking — just what are these pieces of money? A piece of eight is a silver Spanish coin, also known as the Spanish dollar, which was used starting around 1500 and which was the basis for the US dollar. Its name comes from the fact that it was worth eight reales (so it might make more sense to call it an eight-piece coin). Indeed, for those with sharp scissors, the coin was sometimes cut into eight slices, each worth one reale, that were referred to as bits. Thus two bits was worth a quarter dollar, which is a useful fact to know if you should need a shave and a haircut. For that matter, there’s all sorts of other “bit” terminology: a dime, being just short of a bit, was called a “short bit” and a “long bit” was 15 cents. But what about doubloons? A doubloon is a gold coin, worth twice as much as some other Spanish coin. According to Wikipedia, a doubloon is worth two ducats, and therefore worth four pieces of eight or 32 reals. But wiseGEEK says the doubloon is worth sixteen pieces of eight, and therefore worth 128 reals. Who to trust, who to trust. I like the name wiseGEEK, so I’ll go with their story (plus they admit that lots of different coins have been called doubloon). Suffice it to say that doubloon=gold and they’re good to have aplenty in your treasure chest. Pirate flag by oren neu dag, Creative Commons License. Surely you’ve heard of percent, and probably have a sense of its etymology: per centum = per 100, for describing fractional quantities in their equivalent form as parts out of 100. For example, since , we say that 3/4 = 75%. But are you familiar with per mille ? 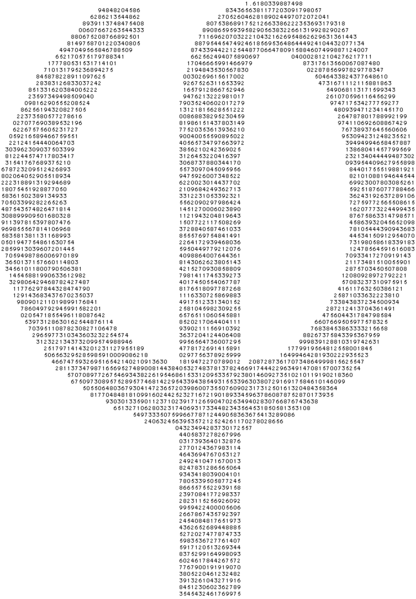 Denoted by the symbol ‰, per mille measures parts per 1000, or equivalently tenths of a percent. Thus 3/4 = 750‰. Per mille measurements occur in a variety of contexts, typically ones in which small-scale changes in value are relatively significant, and so are worth the extra scrutiny that per mille units allow. Typical examples include roadway grades (or gradients), water salinity, and (perhaps most familiarly for our US readers) baseball batting averages. Given that he’s only had 427 at-bats, not all that many digits are significant digits in the decimal expansion; baseball statisticians universally round off such expansions at the third place: his batting average is .365, which one could call 365 per mille. A perfect batter, one who got a hit every single time at bat, would have a batting average of 1. But saying that the batting average is “one” might be misleading, in a context in which baseball fans typically describe a .365 hitter as batting “three hundred sixty five” — it seems “one” might be thought of as .001 as a batting average. So the culturally accepted practice is to say that a perfect batter is “batting 1000”. 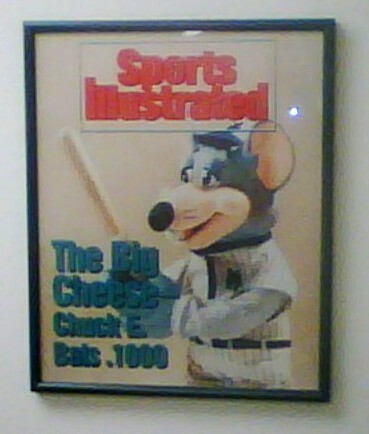 And indeed, their batting average of 1 is also 1000 per mille. It probably comes as no surprise to anyone that knows me that I enjoy playing chess. Indeed, chess is a common hobby among mathematicians (as are Go, juggling, and magic). But I was still amazed to see that a book I was reading, Chess Endings for the Practical Player by Ludek Pachman, was translated by someone named Hardy, and edited by someone named John E. Littlewood. I thought, “No way.” Hardy and Littlewood do chess? The same two that gave us this? Well, I was right. The Hardy is Otto Hardy, not G.H. Hardy, and the Littlewood is John Eric Littlewood, not John Edensor Littlewood. But wow, close huh? Had I been wrong — had the Hardy and Littlewood actually worked together on the book — it still shouldn’t have been shocking. It is fairly common to find mathematicians that study and/or play chess. Former chess world champion Max Euwe had his Ph.D. in mathematics, as do GMs John Nunn and Jon Speelman. (Nunn is also a GM chess problem solver – one of only three in history.) Noam Elkies (the youngest full tenured professor in the history of Harvard – at 26!) has published several papers on the mathematics of chess, and earned his solving GM title in 2001.
the Eight Queens Problem, and the Mutilated Chessboard Problem (posed by Martin Gardner). There’s even a book called Mathematics and Chess. Not all mathematical study of chess is purely recreational. The so-called rook polynomials have found applications in matrix theory and number theory. There’s even a Rook Reciprocity Theorem! Check out Wikipedia’s Chess and Mathematics category for even more connections between the two, and also see Mathworld’s pages related to chess and math. Finally, no discussion of chess would be complete without a reference to xkcd’s comic that inspired these amazing photos. 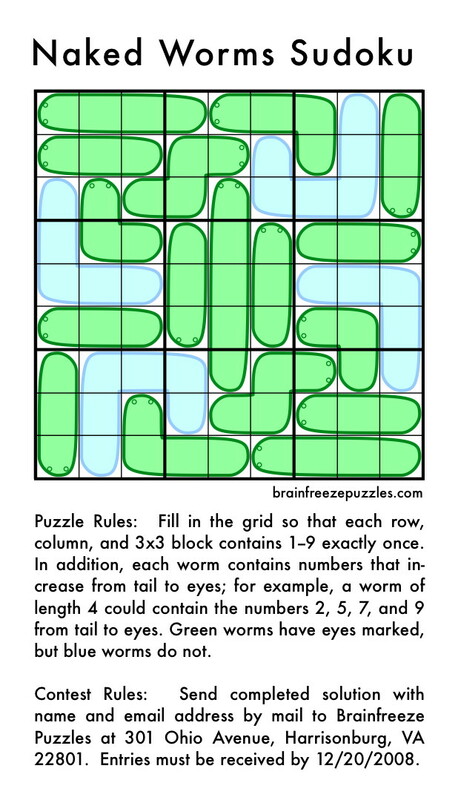 In case you thought worms only did calculus, the folk over at Brainfreeze Puzzles have created a puzzle to guarantee your work stays undone and your house remains messy you have a lot of fun. Or frustration. Or both. And you might even win a copy of their book Color Sudoku! Note: We’ll post a link to the solution when it becomes officially available on the main site [which will be, presumably, sometime after the contest ends]. 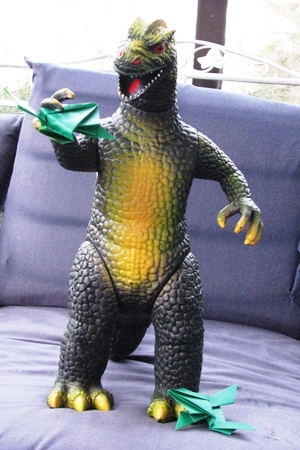 Godzilla likes to fold origami. So do many others. Robert J. Lang, for example, has a great web page with some beautiful origami creations. Lang’s work is art, but his expertise has also been used to solve science problems. One such problem is how to get a really big telescope into space. Bigger than the Hubble telescope. A lot bigger: the lens of the planned telescope is 100 meters, compared to 2½ meters for the Hubble. The solution that Lang worked on was to fold the lens so that it would be small enough to fit in a rocket, but could unfold in space and work. There’s a picture of a prototype (still bigger than Hubble’s lens) and a much more detailed story of the problem and solution here. Another problem has to do with airbags: how can airbags be folded so that, as they are released, they are strong enough to prevent injury in an accident but flexible enough to avoid causing injury themselves? To address this, Lang used principles of origami rendered into computer code. A video and the complete story are available here. I learned of Lang’s work through this article on MAA Online a few days ago.